Carmen Roberts reports from Japan on the game-inspired go-kart tours of the city that have got everyone talking. Plus the latest advice on how to travel without using plastic. Browse content similar to Tokyo Go-Kart. Check below for episodes and series from the same categories and more! Now on BBC News - The Travel Show. travelling without too much plastic. alone in America's smallest town. where I chose to stay. -- or. gamers can test their retro skills. childhood. Yoshi, Luigi and Mario. just stop in one straight line. OK? two go-karts behind me there are? Is it possible to stall it? cut out, you just start it began. that feels so low and exposed. Tokyo and I am dressed as a fact,. we met still had concerns. looking into how safe they are. other road users and pedestrians. drive this on the streets of Tokyo. way to see the city. -- waving. and kimonos that. -- snaps. there is not much competition. they go away. -- don't go away. here. Quite a lot of resorts. I have heard a lot. gear, ski gear, all sorts of stuff. because you are riding a bike. extended about a full-sized cup. just family pictures we had taken. family picture we had. That is me. business. I open the Bharat Nayan. to visit and have a cup of coffee. They leave messages for one another. everyone feels welcome to come. library. He had accumulated looks. of anybody who comes to borrow some. the time Henry headed to Australia. don't know what is going on. 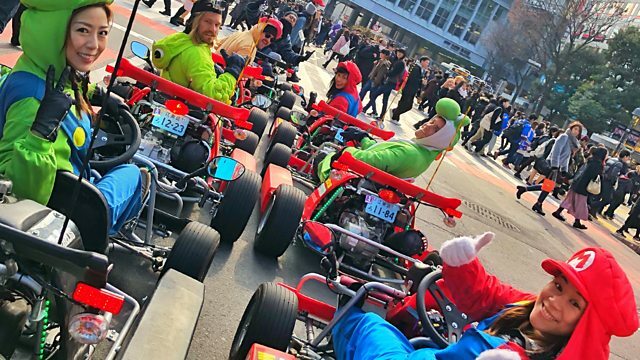 Carmen Roberts reports from Japan on the video game-inspired go-kart tours of the city that have got everyone talking. Plus the latest advice on how to travel without using plastic, and the woman who lives alone in America's smallest town.